The tapping technique on guitar is either hated or loved by most guitarists. Maybe it is because this technique is strongly associated with Eddie Van Halen and the 80’s glam metal era. The technique in and of itself is not only applicable for metal genres can and is used in a lot of different genres and styles. This technique is very useful for reaching parts of the guitar neck, that you would not be able to reach otherwise. 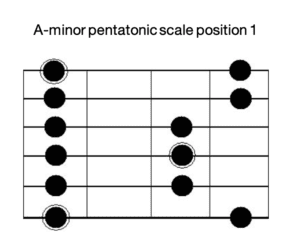 In this lesson you are going to learn how tapping can be applied to play pentatonic licks. 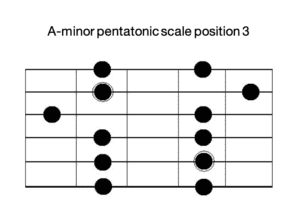 The value of these tapping licks are not the tapping licks themselves, but the underlying principle. If you can play and understand these licks you are well on your way to being able to create. This article does not delve deep in to the actual techniques used to tap, do hammer on’s or pull off’s. If you would like to learn, we have other articles, or you can come see us in person. JIn the videos below, you can see me demonstrating too. In the first lick we are going to be using the first and forth position. These two positions complement each other very well. 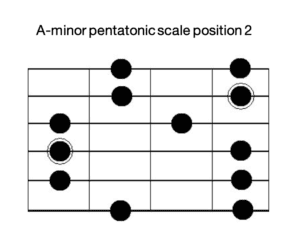 Most people are very familiar with the first position and when tapping through the fourth position in this exercise you only have to tap on the 12 fret on all the strings with the exception of the B-string, where you have to tap on the 13th. In the first lick we are almost exclusively using hammer on’s and tapping. We will be using pull offs in a later lick. In the next lick we are going to use the exact same scale positions but we are going to play a descending lick, which means that we will be using pull off’s a lot more in this lick. Now I want you to start using this stuff in you own playing and to expand you own creativity. When you have earned these two licks in isolation your assignment is to switch things up. 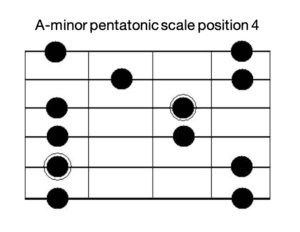 For example, try playing this lick, but vary the position you are tapping in. 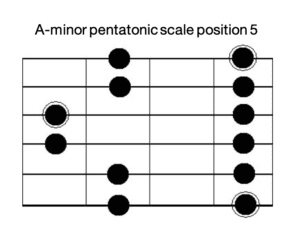 Instead of tapping on the twelve fret, try moving up one position and starting your tapping on the fifteenth fret or down a position starting on the tenth fret. Listen to how this sounds. Now try to change the rhythmic feel in all positions, try to move your fretting hand around as well, skip strings and so on and so forth. Keep doing different variations until you come up with something that you like.